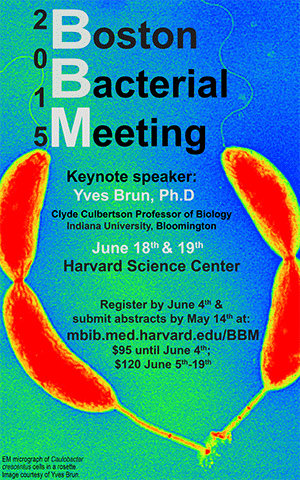 Registration is open for the 2015 Boston Bacterial Meeting! For the past 20 years, the annual Boston Bacterial Meeting (BBM) has brought together microbiologists from both academic and industrial settings from New England and beyond. Last year’s BBM was attended by almost 500 researchers, representing over 100 labs and companies. BBM2015 will take place on Thursday, June 18th, and Friday, June 19th at the Harvard University Science Center in Cambridge, MA. We are pleased to host Professor Yves Brun from Indiana University, Bloomington, as this year’s keynote speaker. Professor Brun has done groundbreaking work to understand the mechanisms of bacterial attachment and biofilm formation. He is also one of the few microbiologists who has studied bacterial morphology and development from both cell biological and evolutionary perspectives. QUESTIONS? Check out the website or contact the organizing committee at bbm@hms.harvard.edu.